Building: This small, simple and much loved village Church has no great tombs or fanciful carvings to decorate the interior. At a squash it can seat 80 people. It is set at the heart of the village in it's own ancient Churchyard above the Village Green. Most of the inscriptions on the tombstones mark the graves of the farmers and farm labourers who have lived and worked for generations in this agrarian hamlet, with its five farms and associated cottages in an unspoiled area of mid Nottinghamshire. 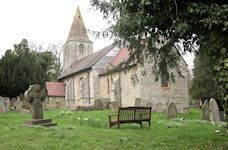 Worship: Services are held at 08:30 on the second and fourth Sunday of the month, alternating with the next-door village of Winkburn, where the services are on the first and third Sundays at 08:30. On the occasional fifth Sunday a combined service is held for the Cluster of parishes which include Bilsthorpe, Eakring, Kirklington and Farnsfield. At present the services are simple, said services of Holy Communion from the 1662 Prayer Book usually lasting just over half an hour. There are around 10 villagers who gather in the winter behind a heavy curtain that separates the Chancel from the Nave. The Chancel is heated by bubbling Calor Gas heaters. In summer they spread into the nave. Visitors are always warmly welcomed. Special services are held to celebrate Harvest and Christmas.